Anthony Haughey’s 2013 show ‘Citizen’ seems more topical than ever. My short review of a complex body of work appeared in the Visual Artists’ News Sheet. Issue 3, May – June 2013. It may be nestled in a nineteenth-century friary, but Drogheda’s municipal art gallery is not a temple of obedient hush. Something of a hub in the medieval town, the gallery’s proletarian buzz seemed well fitted to an exhibition called ‘Citizen’, though Anthony Haughey’s ‘citizen’ is an individual not easily defined. The exhibition is concerned with life beyond recognised boundaries, its title positing question marks as much as a declaration. What is a citizen? What is the relationship between an individual and a state? How is this negotiated? And what happens when one side of the equation no longer feels at home with the other? The exhibition, “a culmination of research and artist projects from the last few years,” is a compilation of separate works, or fragments of works, drawn from a practice of community-based collaborations focusing on the issue of migration. (1) Haughey is interested in people and in the often-difficult relationship between people and place. An early group of photographs, ‘Home’, made while living and working in Ballymun in the late 1980s and early 90s, examined ideas of ‘home’ from the perspective of those who couldn’t wait to leave it. Home could be somewhere imagined as much as the place you were already in – the theme of longing for somewhere else has been a consistent theme in Haughey’s oeuvre ever since. Suspended incongruously in front of the church’s former altar space, the video projection Ghost Vessels, documents harrowing journeys from North Africa to Europe across the Sicilian channel. The soundtrack of voices and turbulent seas was loud in the bright open space but the images on screen were difficult to see properly. A roving camera in the video work Progress ll was also unsettling. In an engaging dialogue about place and identity (reenacted from a blog conversation) the articulate group of mostly recent migrants to Ireland seemed more harried than identified by the restlessly recording eye. Collective elaboration of meaning can reside in the processes of production as much as any subsequent modes of display, but as a viewer I am restricted to witnessing outcomes. As a viewer of these complex works – while acknowledging their collaborative nature – I sometimes missed the authority a more singular vision can bring. Two large portrait photographs of Mosney residents also make somewhat ambiguous statements. 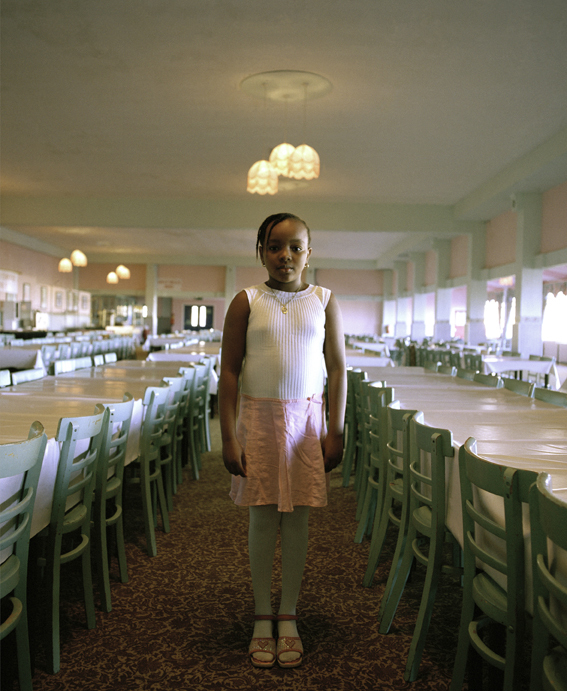 In Ezi, former Butlin’s Mosney Dining Hall, a young girl stands between rows of diminutive dining furniture. In an area reserved for children (from a time when children were seen but not heard) the anachronism of the setting puts the girl in an odd relation to the scene. Her light summer clothes are carefully colour-matched with the surrounding room but it’s not obvious why – is she attempting to blend in with her environment, or has she already been subsumed within it? Either reading seems peculiar in the circumstances. Lorlor, former Butlin’s Mosney Ballroom employs a similar device but without making the issue any clearer. An avowed aim of the work is to “dispel myths and reductive stereotyping… [to help] migrants reclaim their agency”. (2) A series of large photographs show border fences between North Africa (Morocco) and Europe (Spain). While these so-called ‘separation barriers’ are often flash points of conflict and dispute, Haughey’s pictures are serene. In Hakim, Mount Gurugú Forest, Nador, near the separation fence between North Africa and Europe, a man kneels in a sun-dappled clearing. His head is covered and his shoes lie beside him on the ground. Subtle hints of habitation blend into the surrounding terrain. Framed between trees, his gesture of supplication evokes humility, reclaiming agency in his own quiet way.